Fresnel lenses are based on one simple concept that we learn in beginning optics: the angle of light ONLY BENDS at an interface between two mediums with different refractive indices. A readily available example of refraction is shown below. This property of light is described by Snell’s Law, an equation that determines the angles at which the light will refract. Although the pencil is not a ray of light, light is bouncing off the pencil into our eyes. This is what we describe as a real image, a point where light diverges from. The most common shape for optical lenses that need to focus light is the “plano-convex” lens, plano referring to a singular flat side of the lends, and the convex referring to the outward curve of the glass on the opposite side. The Fresnel lens, shown left has the equivalent curves of the plano-convex lens, but reduces the amount of excess material in the middle. This increase in material/ focusing power is what makes Fresnel lenses ubiquitous in daily life: old TVs, headlights, projectors, etc. Figure 3: Formation of a Fresnel lens. When glass was first used to create Fresnel lens, the edges were rubbed down manually. With the rise of technology with plastics, a simple mold can be utilized to build many Fresnel lenses. Since the structure of Fresnel lenses has been solved, many companies have utilized them with cheap acrylic or polycarbonate for mass production. The advent of cheap magnifiers has spurred the rise of Fresnel lenses in industry. Fresnel lenses can also be used to “collimate” light. Collimation of light is changing the rays of light from a scattered wavefront into plane waves. This organizes the light and it is said that this light “comes from infinity”. This property was first exploited in lighthouses to project light over very large distances which minimized the effects of light loss. All Fresnel lenses share this characteristic to some extent large or small. However, I will repeat again that Fresnel lenses are poor for retaining image quality. While some Fresnel lenses are sold in stores as simple magnifiers for book reading, the ridges towards the exterior of the lens cause chromatic aberration, a different type of screwup at the focal point that causes light to not focus at the same point due to the different wavelength of lights bending slightly differently. Fresnel lenses most unique applications can be found in solar heating and smelting. 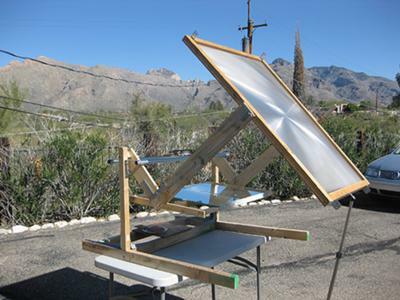 Because Fresnel lenses are cheap and focus light very well, they’ve been displayed in multiple solar heating systems as well as smelters for focusing light in wilderness. They’re commonly sold as replacements for matches. Fresnel lenses have also been used as simple magnifiers. Here’s an example in use as an aid for reading. Aberration of the image is created by the ridges of the Fresnel lenses. Theoretically, the most effective Fresnel lens would have an infinite number of ridges from the center to the radius of the lens. Historically, Fresnel lenses have been used in lighthouses to signal to nearby ships that they were near the coastline. The added complexity to the lighthouse lenses were for retention of light from the source, to gather more oblique light for use by the lenses themselves. The Lawrence Berkeley National Laboratory utilizes zone plates of Fresnel lenses to focus soft x-rays that are produced by the synchrotron. This helps focus the x-rays, which unlike light from the visible range, are affected by the width of the lens. I would hazard a guess that the ability to focus x-rays or ionizing radiation in the near future may utilize more advanced variations of a Fresnel lens to kill cells, or study them via increase in resolution surpassing current limits. Fresnel lenses are used in our daily lives, but have applications in survival, sailing, and imaging. A better understanding of Fresnel lenses helps us better understand some of the processes that we exploit. A few topics that I’ll be looking into for the next article will be the camera lucida, a forgotten apparatus for artist or perhaps something more biologically oriented, the concept of geophagy. Cheers!